Home WiFi Alert- WiFi Analyzer is a brand new WiFi app that was previously only available for Android devices. Recently the developer has released a brand new and polished iOS version of the app, allowing long-awaited Apple users to finally be able to get this app on their phones. The app is very popular among tech-savvy communities for being really useful for every day usage. But just in case anyone out there hasn’t heard of it, we’ll quickly go over some of the things the app is very good at. 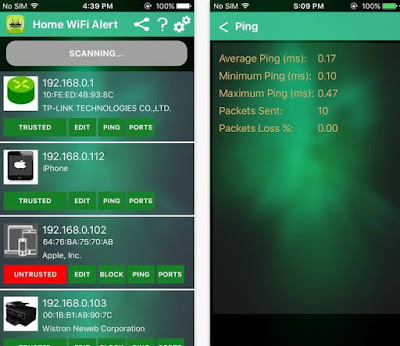 When using Home WiFi Alert- WiFi Analyzer, users can detect and deal with any unwanted guests connected to their internet address. Users can then quickly deal with the matter by putting any suspicious devices in a special blacklist, while the devices they trust can be put into a friendly list. It also displays names, IP addresses, Mac addresses, shows you all of the access points you’re connected to, and so much more. If you’re a dedicated and tech-loving geek, you can really lose yourself while checking out all the crazy options that this app has to offer. But even if you’re a beginner, the app has made it so incredibly easy to get the hang of things really fast. You can find and download this app from the App Store.